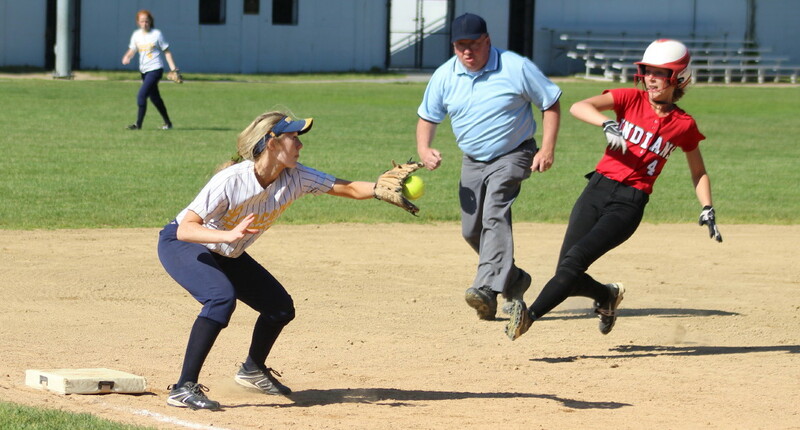 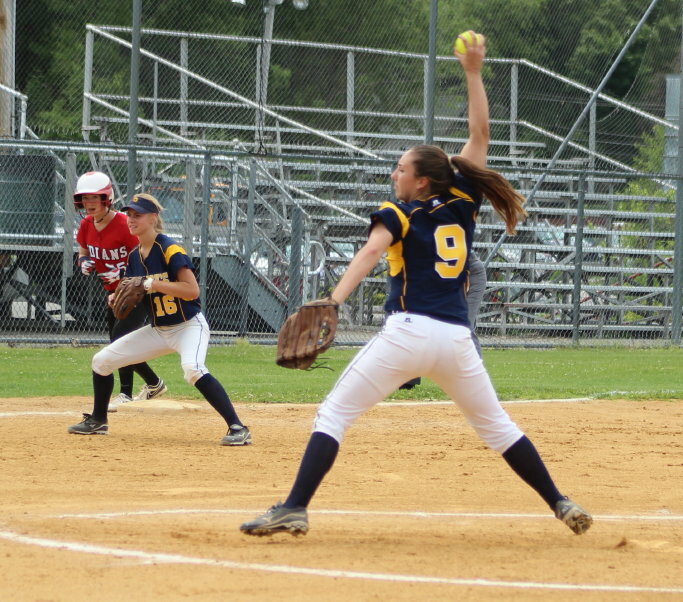 (Lynnfield MA) Converting second chances played a big part in Amesbury’s, 6-4, win over Lynnfield in eight innings on a sunny Wednesday afternoon of Cape Ann League softball. 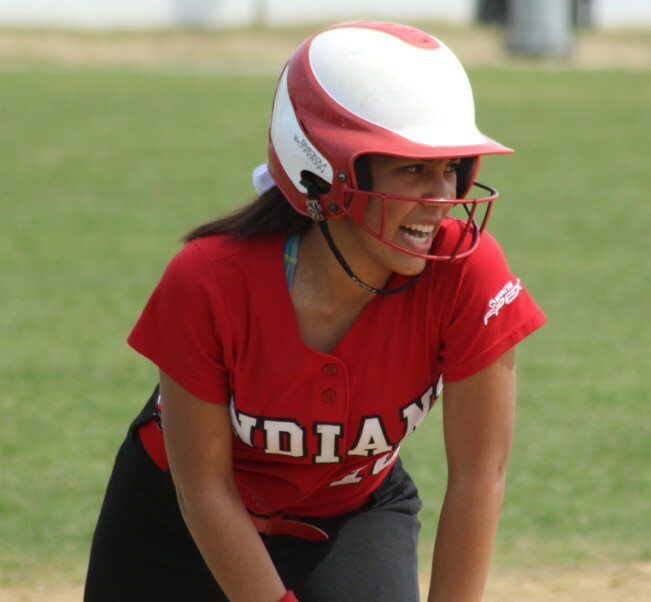 The Indians (11-4) had the Pioneers (8-9) down by three runs, 4-1, with two outs in the seventh inning. 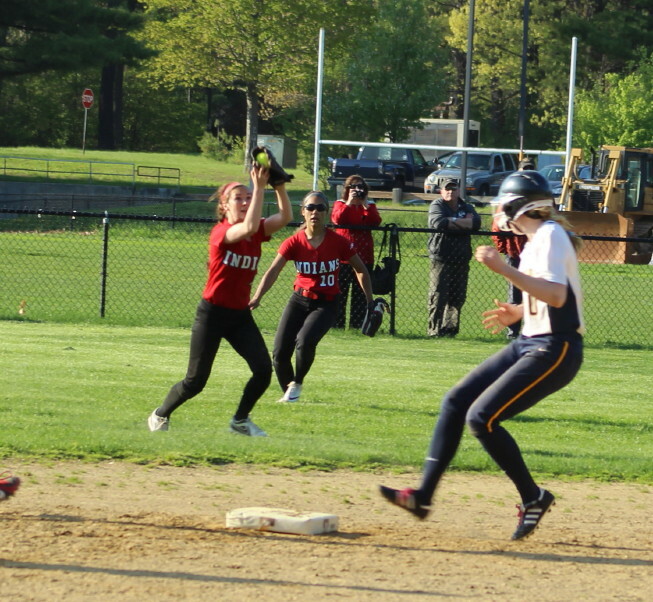 However, a boot by AHS shortstop Maddie Napoli and a dropped popup by second baseman Lauren Fedorchak delivered the tying runs for the Pioneers. 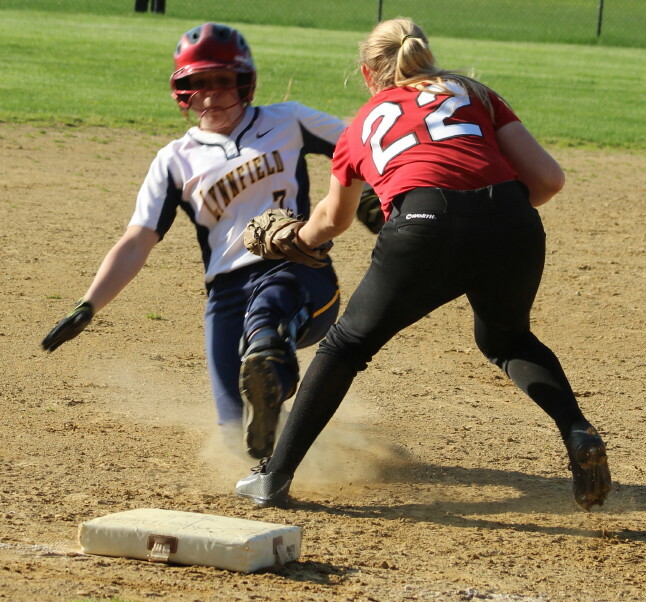 That exciting seventh inning ended for Lynnfield with Malia Roberto, carrying the winning run, getting tagged out at third by Autumn Kligerman. 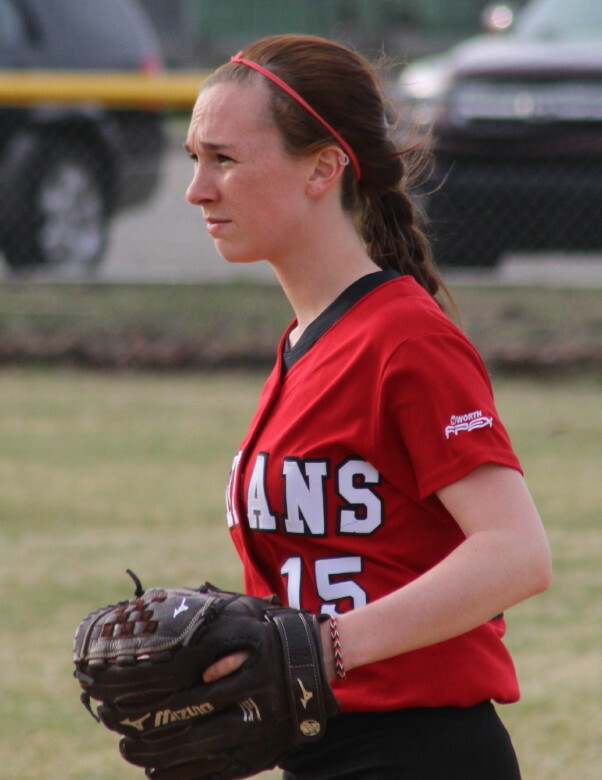 The visitors had only five hits off of LHS pitcher Sadie Oliver but collected two of them in the extra inning. 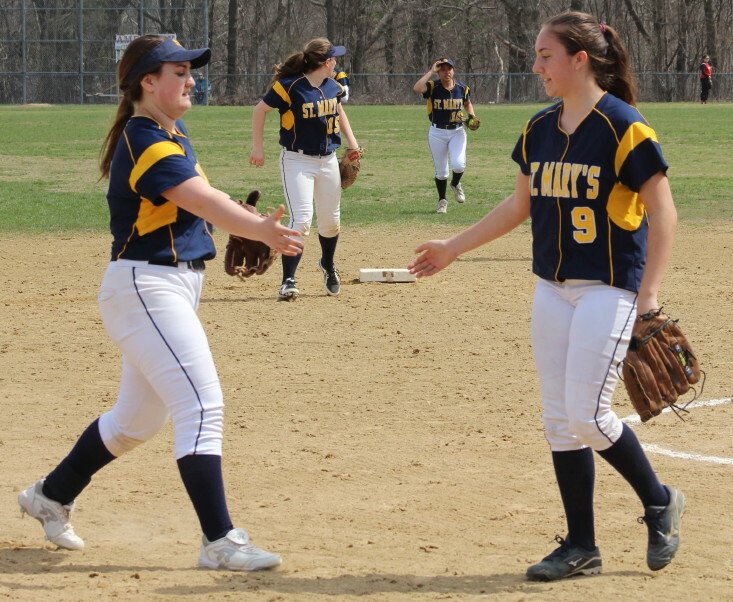 Amanda Schell singled and Rachel Cyr walked to start the inning. 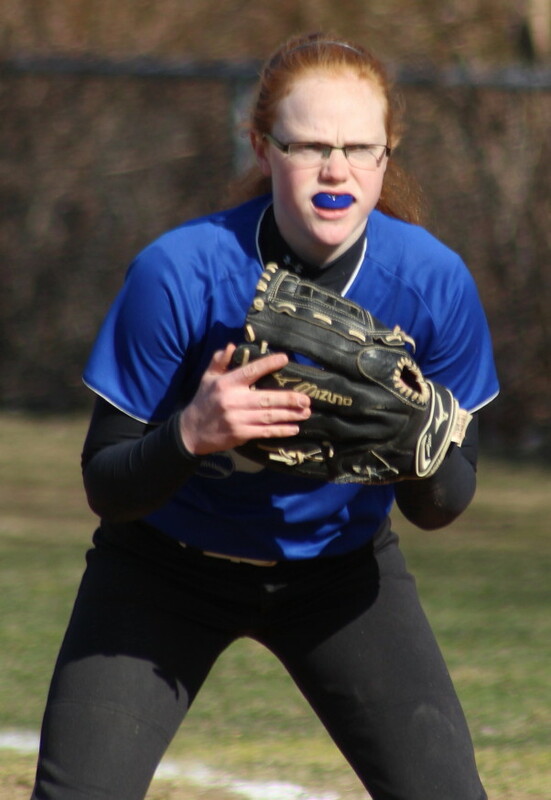 They both moved up on a fielder’s choice and scored easily on sophomore Zoe Fitzgerald’s sharp single up the middle. 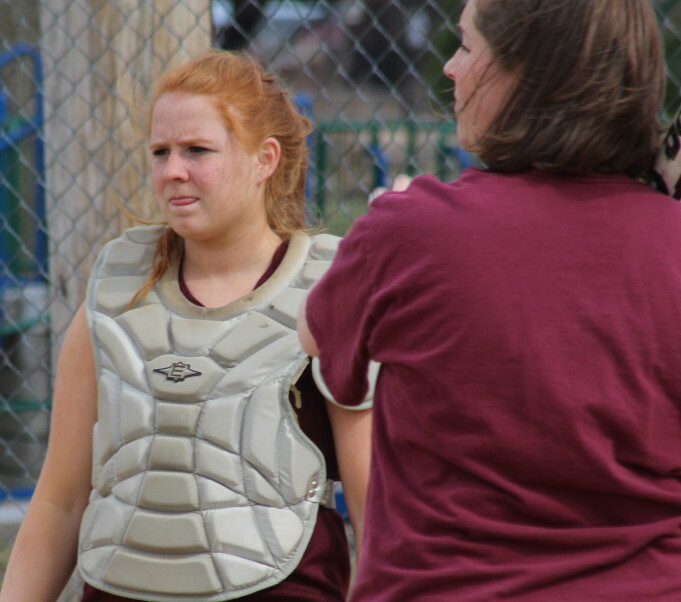 Those two runs looked to be enough………..unless you recalled the previous inning in which three runs looked like enough! 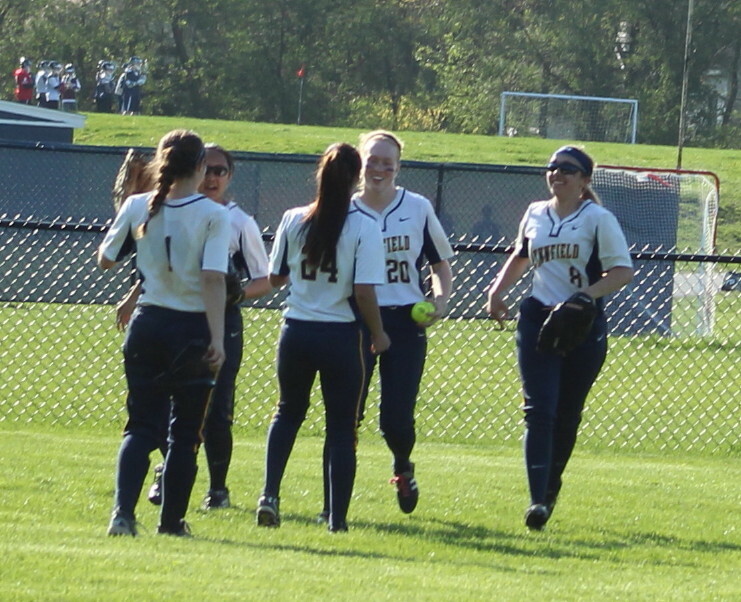 After two outs Lynnfield had two straight singles (Lauren Guerra and Hannah Travers) and visions of the previous inning started dancing in everyone’s head. 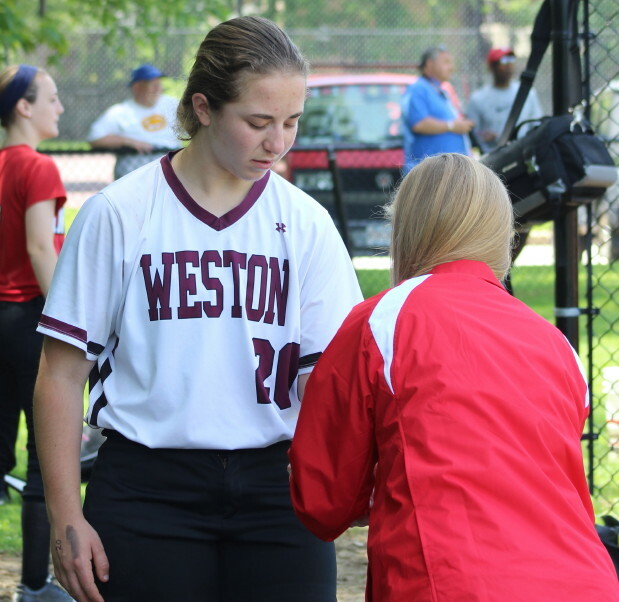 But second baseman Lauren Fedorchak was given a second chance to end the game and this time held onto Rachel Buzzotta’s popup to do just that. 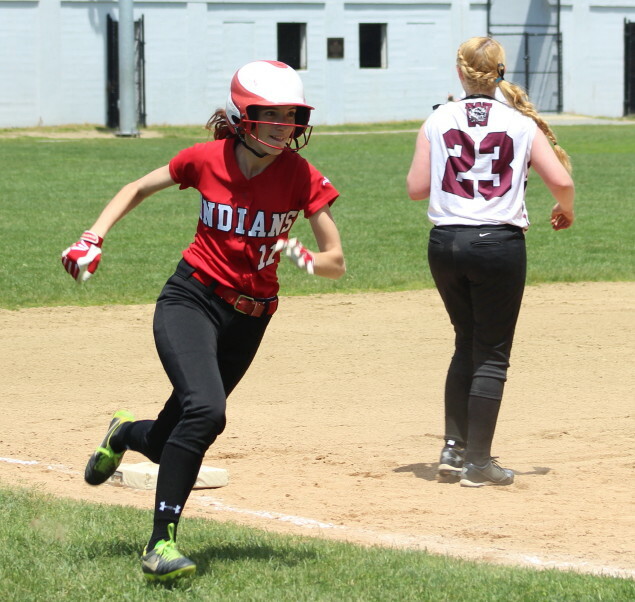 Amesbury has won five straight and have made the post-season tournament. 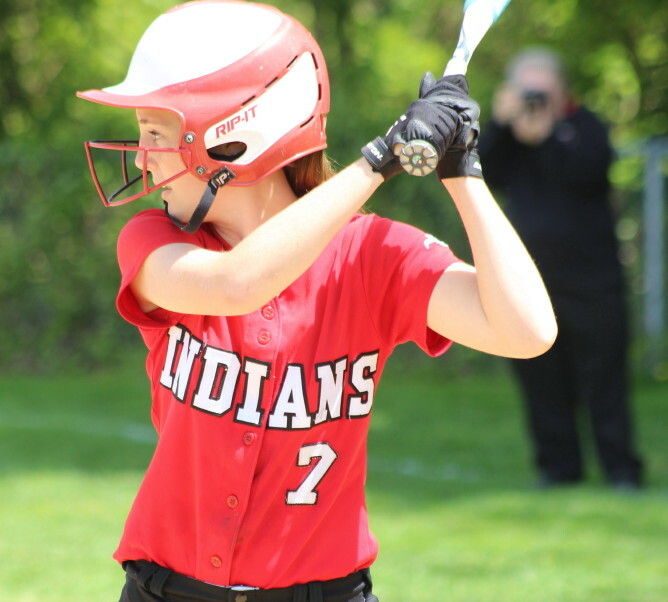 For the Indians the final five games will be about getting as high a seed as possible in the Division 3 state tournament. 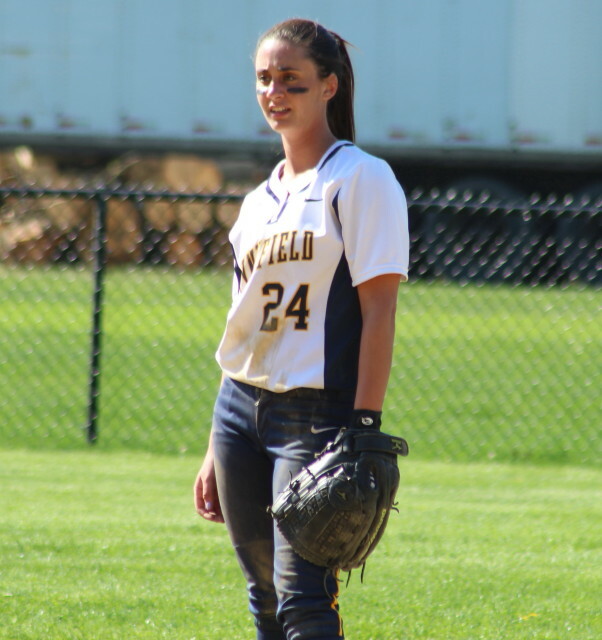 Lynnfield still has to make the tournament. 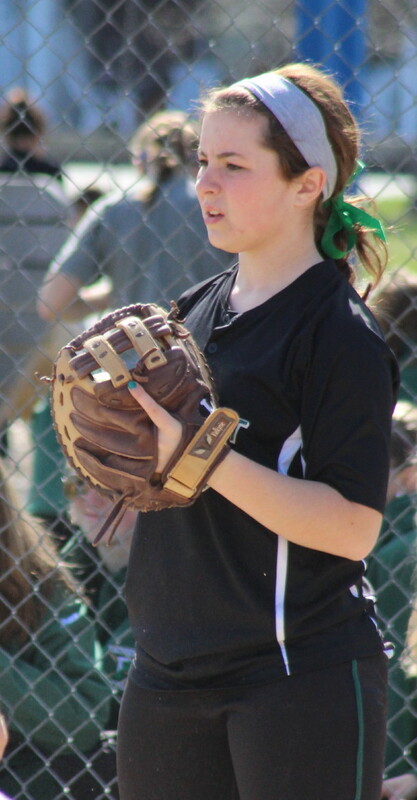 Ten wins will do it. 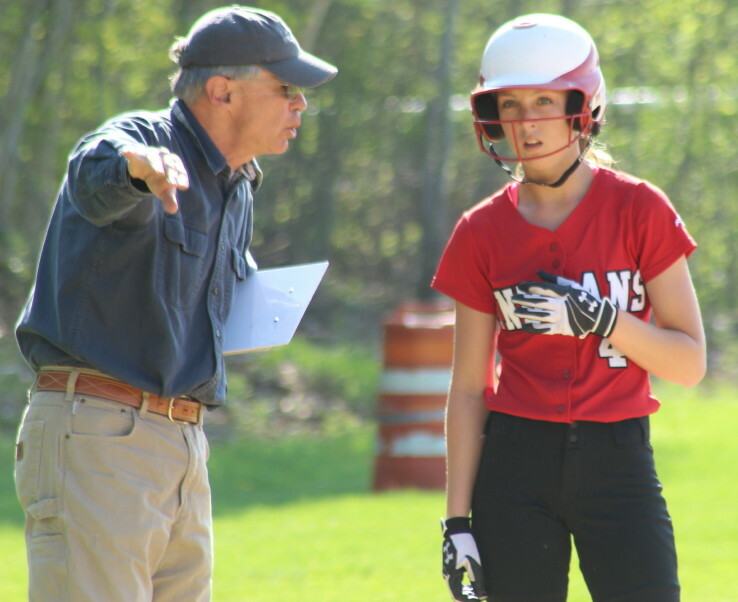 They must win at least two of their last three games. 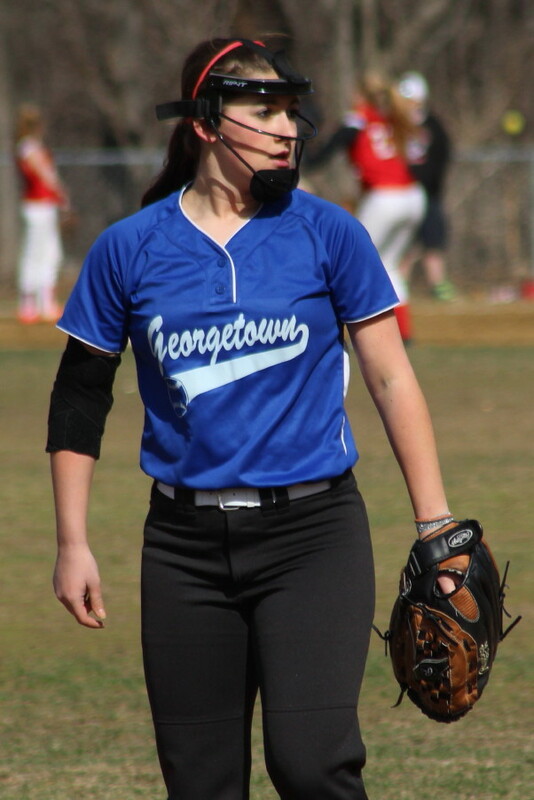 I like their chances of getting what they need since they’ll be playing three teams (Ipswich, Georgetown, Manchester-Essex) with losing records. 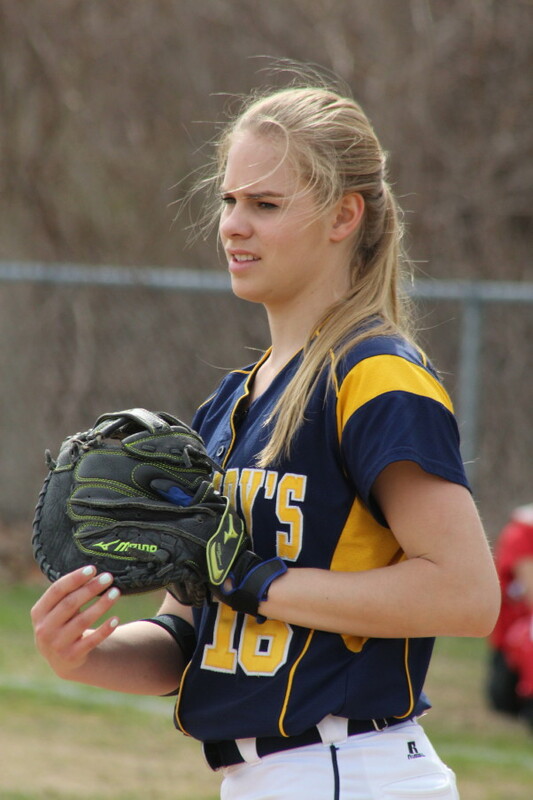 The Pioneers certainly had plenty of hits (ten) off of AHS pitcher Rachel Cyr but stranded ten runners. 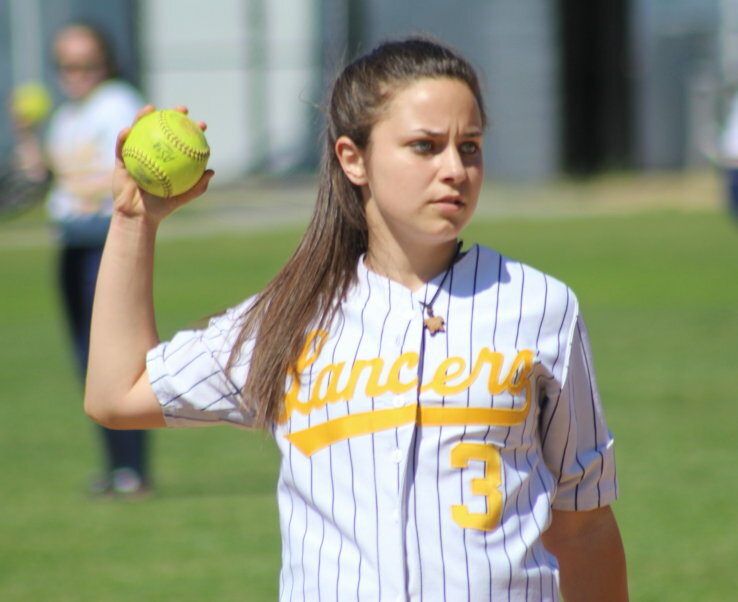 Why LHS didn’t score more times with all their hits was because three Pioneers (Hannah Travers, Annika Han, and Lauren Guerra) had eight of the ten hits. 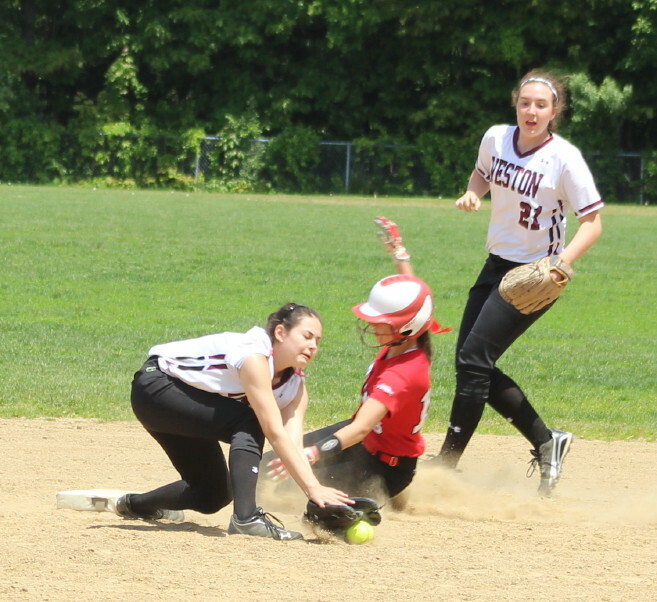 Amesbury started the scoring with a tainted run in the second inning. 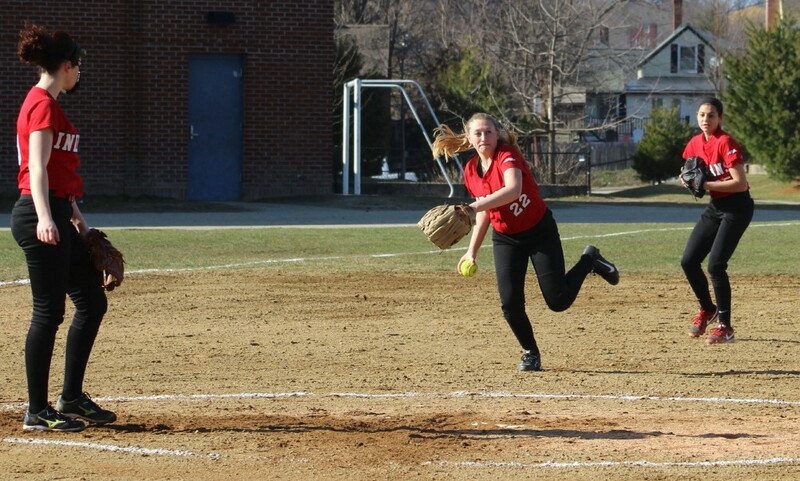 Autumn Kligerman doubled but reached third on a bad relay throw from leftfielder Malia Roberto. 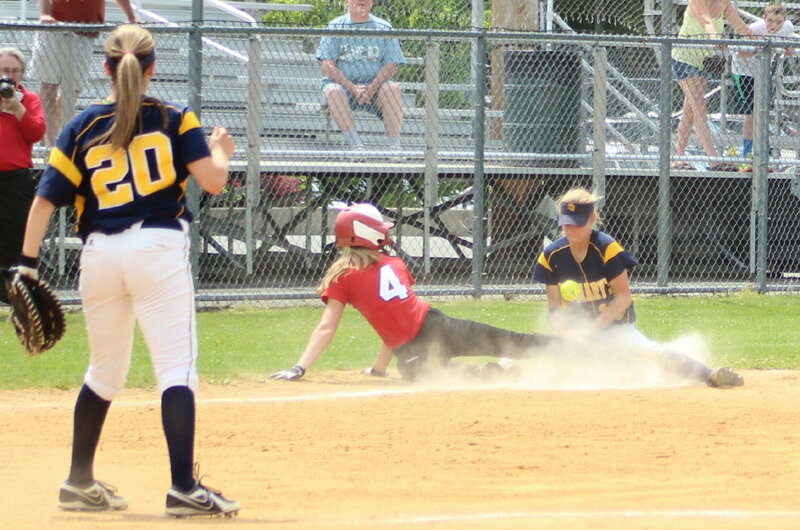 Autumn later slide home on a wild pitch by Sadie Oliver. 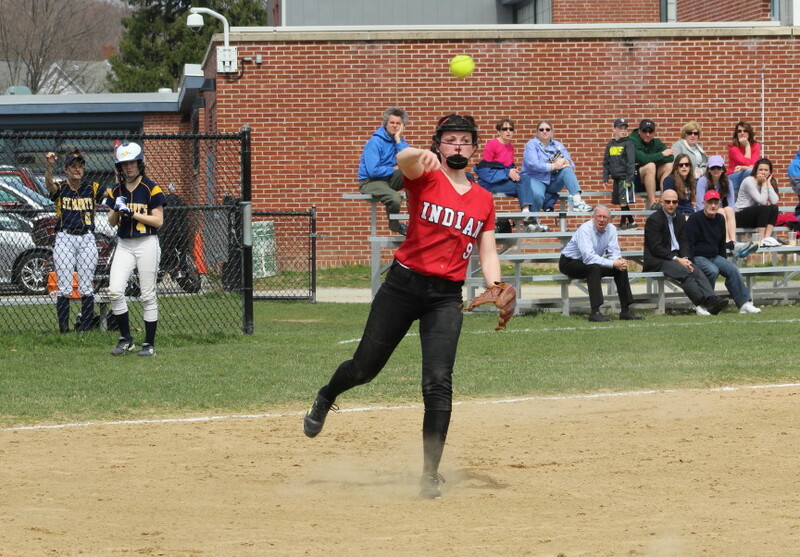 The Indians started the fourth inning with two straight hits (Meg Aponas single, Amanda Schell double). 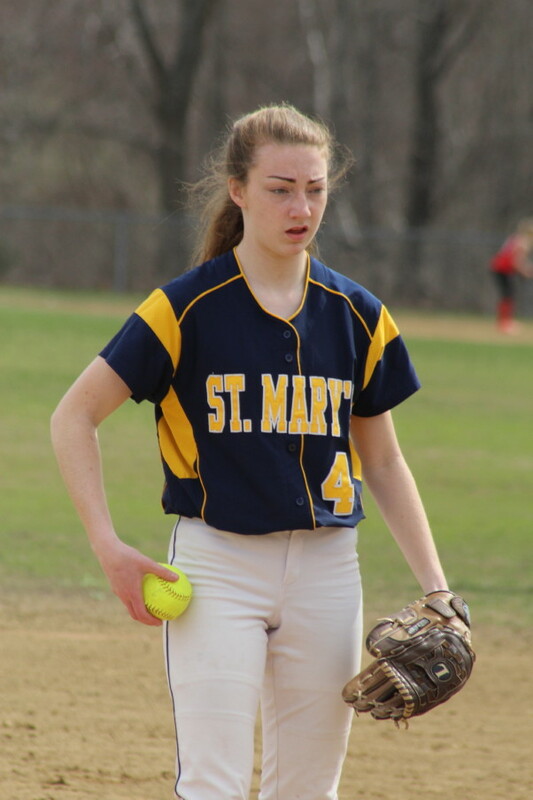 Rachel Cyr’s sacrifice fly scored Meg. 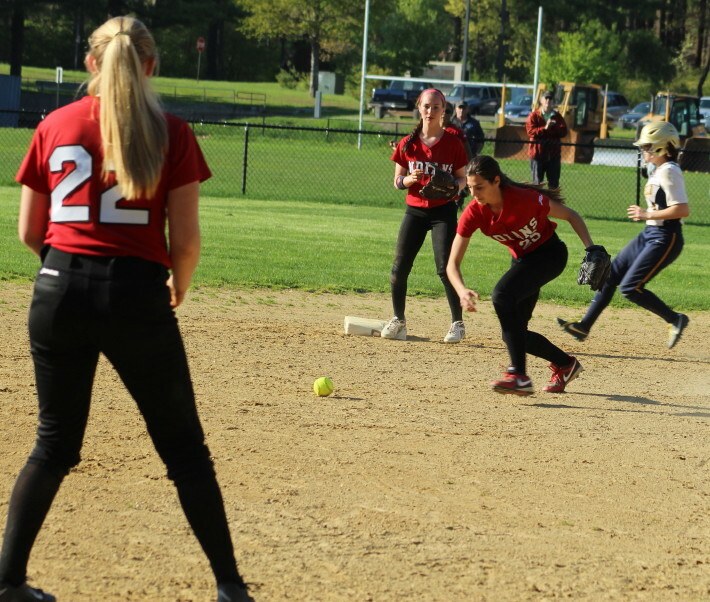 Before the inning was over Amesbury would get two more runners to third (Amanda Schell, Autumn Kligerman) and both would come home on wild pitches. 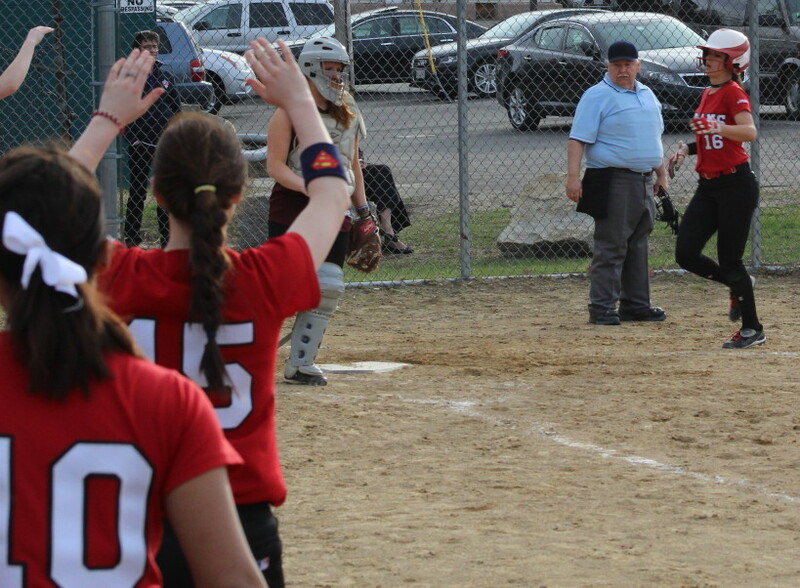 Amesbury carried a 4-0 lead into the sixth inning. 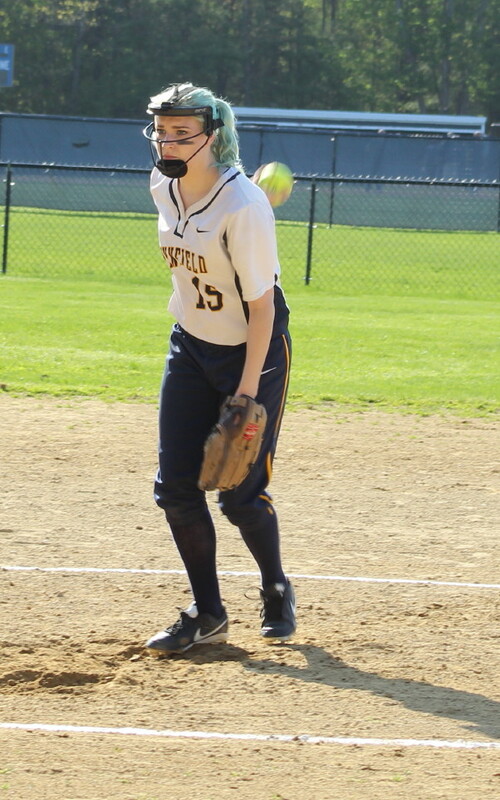 In that inning Annika Han of Lynnfield singled, stole second, and reached third on a passed ball. 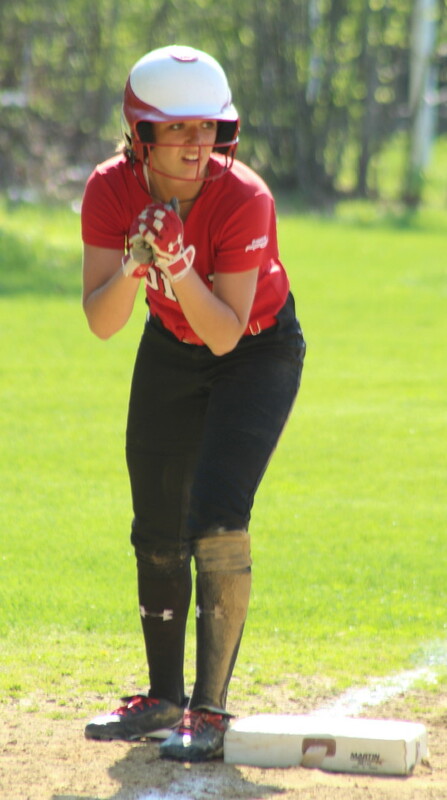 Malia Roberto’s single into right field put the Pioneers on the board. 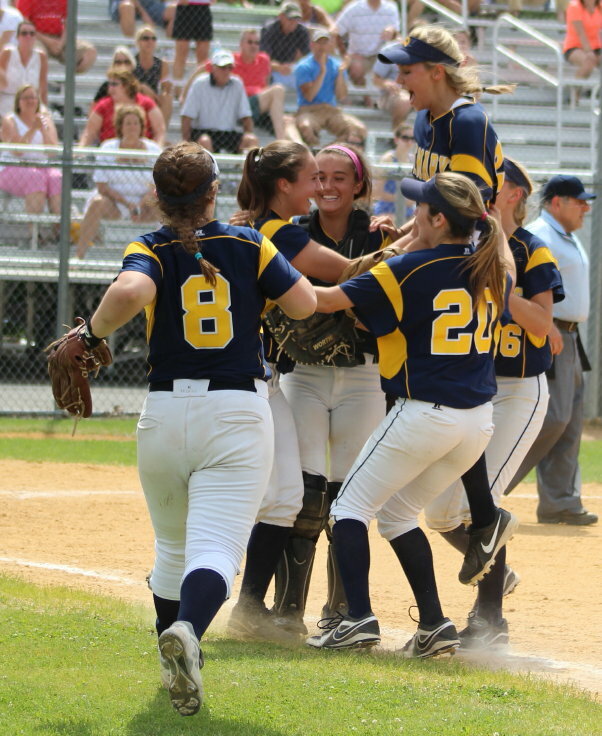 The exciting seventh saw Lynnfield rally to tie the score, only to lose in the eighth inning. 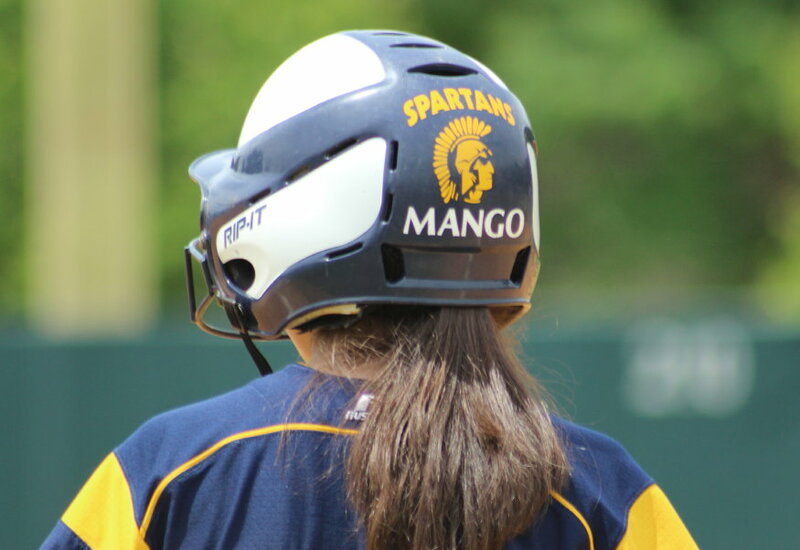 The good crowd on hand saw a terrific running catch by centerfielder Hannah Travers to take away a double and possibly more from Meg Aponas to end the sixth inning. 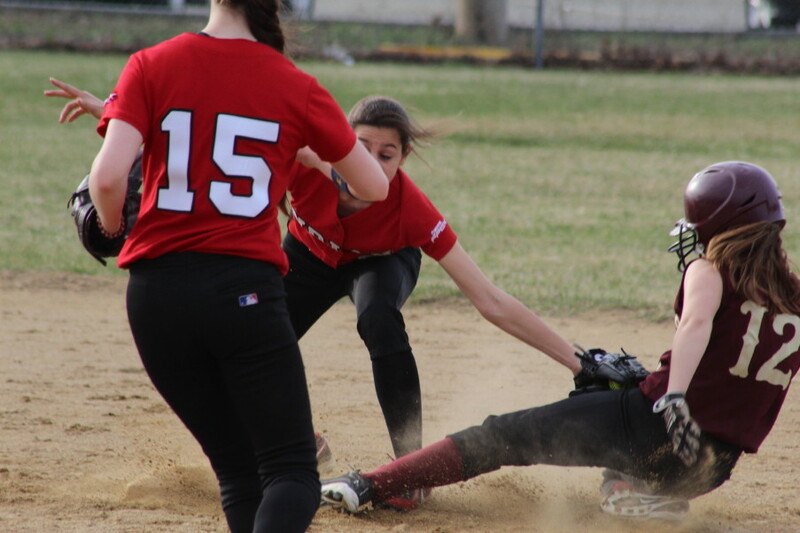 The LHS junior went straight back and dove to make the catch. 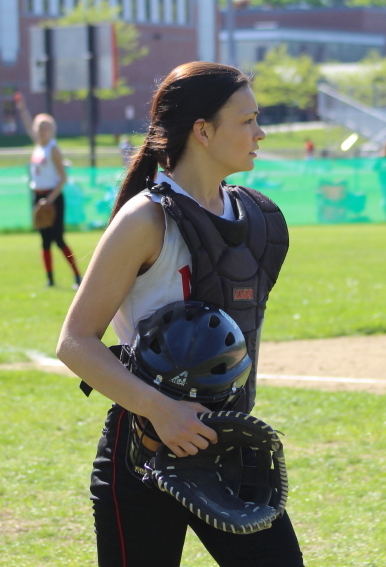 Third baseman Autumn Kligerman had a strong game at third for Amesbury especially in the third inning when the AHS junior had three assists. 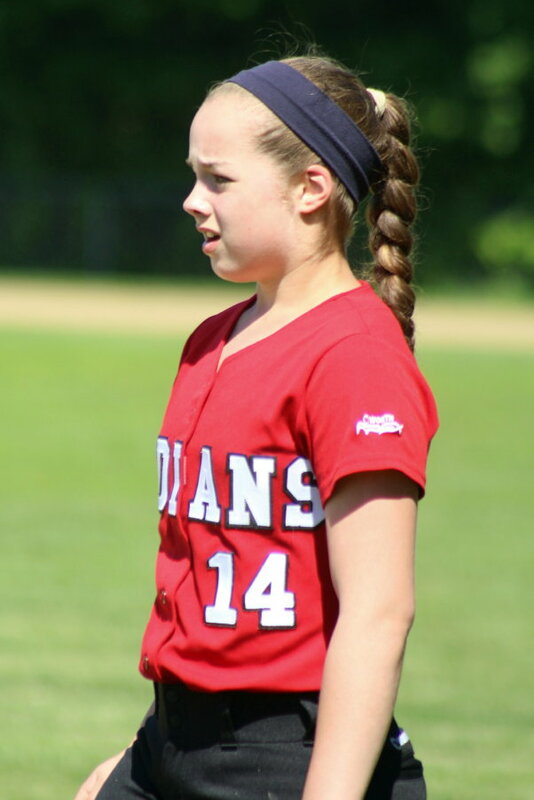 Weather? 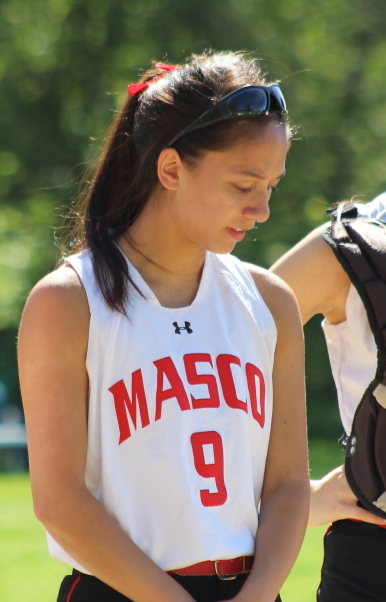 Just terrific. 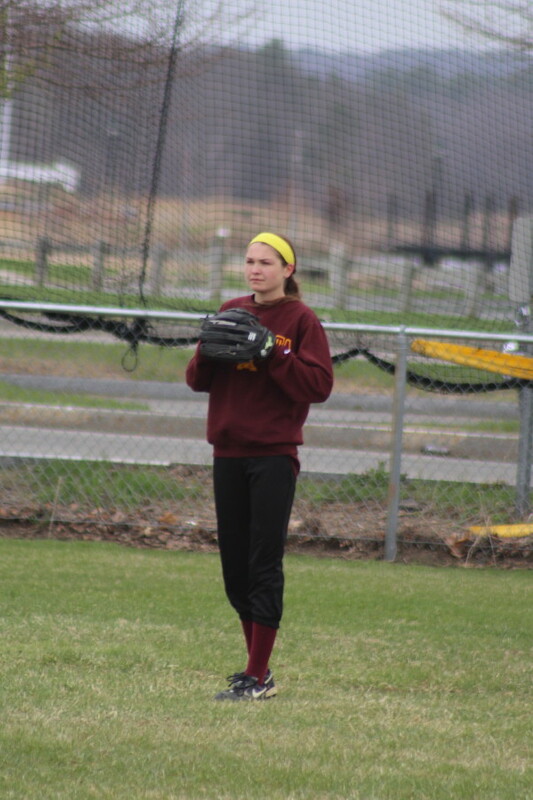 After yesterday’s 50’s I was overdressed for today’s 70’s. 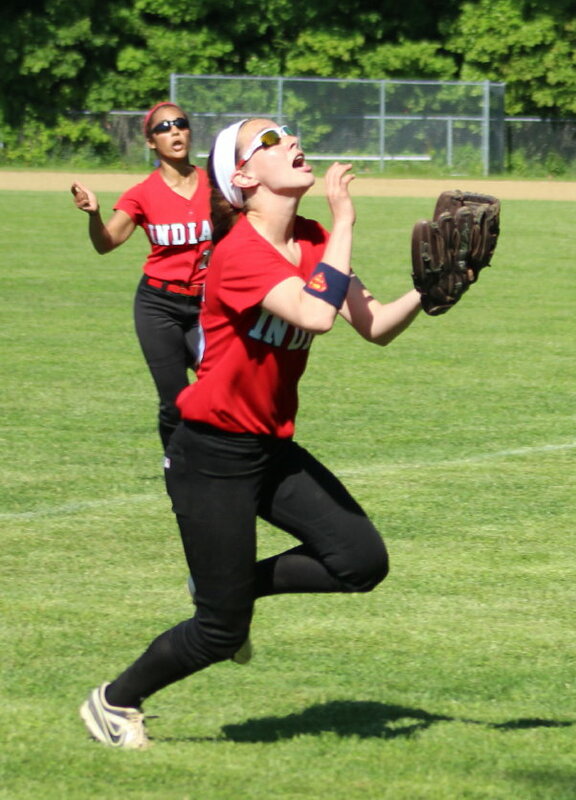 Autumn Kligerman and Amanda Schell each scored two runs for Amesbury. 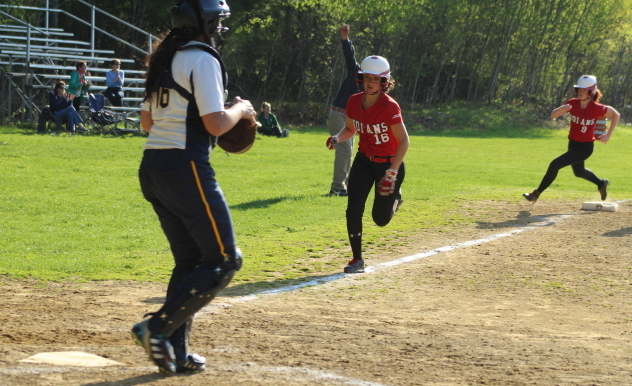 Amesbury won the previous meeting this season between the two teams, 9-7, on April 11th. 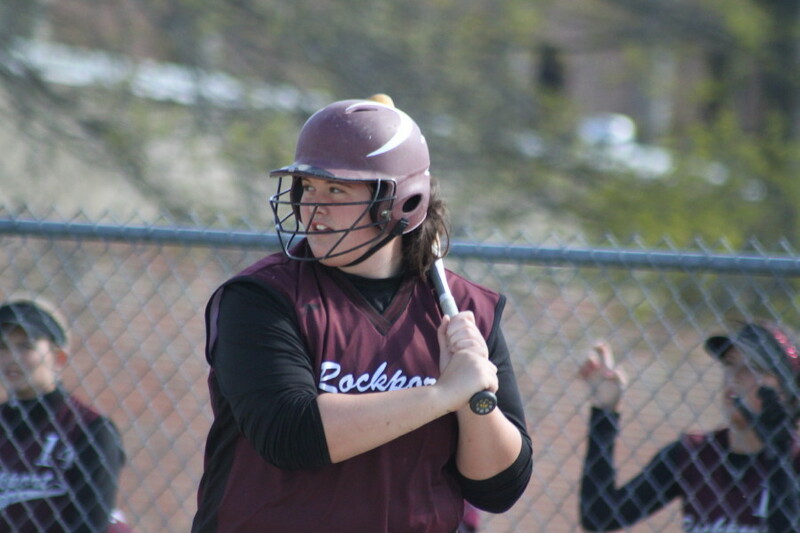 Next game for the Indians is at Rockport on Thursday. 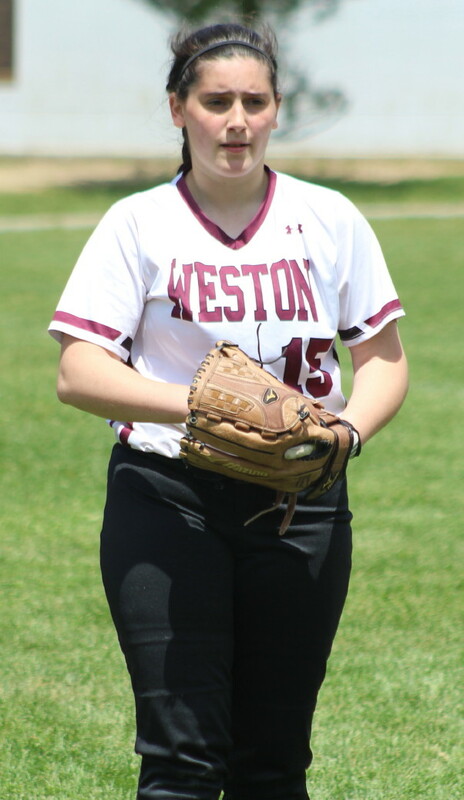 (Newburyport) Newburyport batted around in two of the last three innings and overtook Amesbury, 16-15, on a very windy Monday afternoon in Cape Ann League softball. 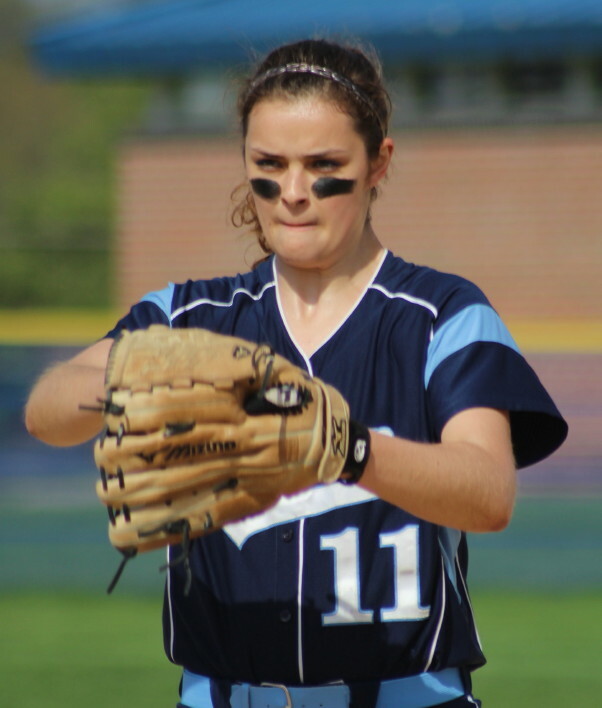 The Clippers (2-2) were down by two runs with two outs in the bottom of the seventh but a two-run single by Lauren Singer tied things at 15-15. 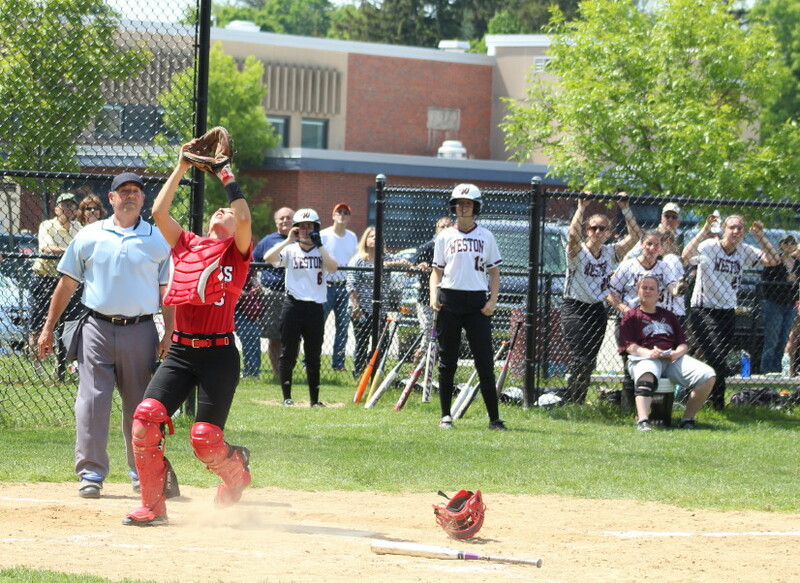 A catcher’s interference call followed loading the bases and pitcher Rachel Cyr’s walk to Morgan Johnston forced across the game winner. 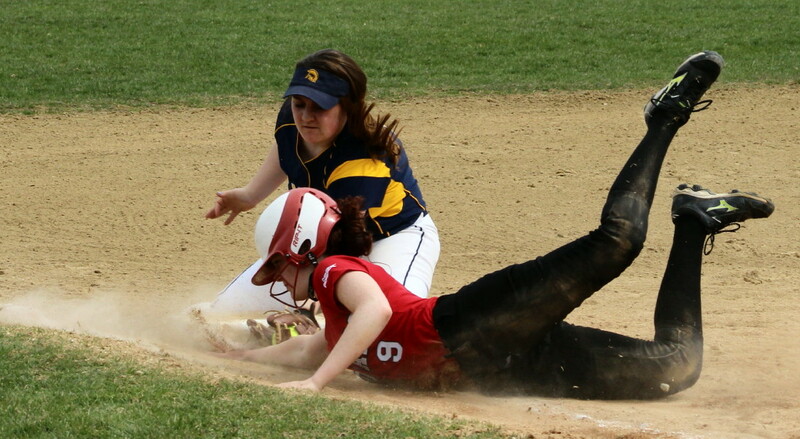 This game was anything but smooth. 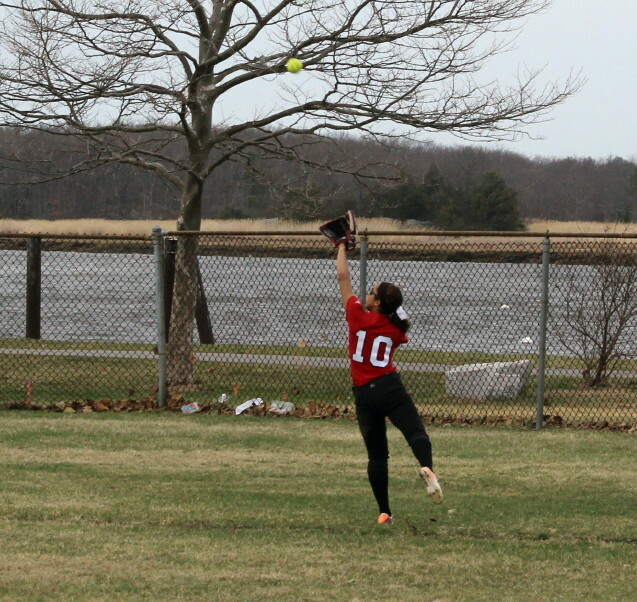 The 20-30 MPH gusty winds made every ball in the air an adventure. 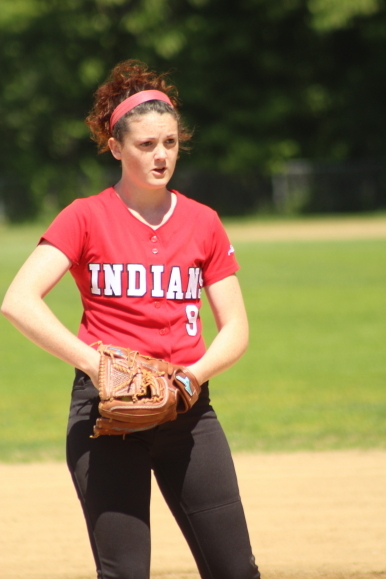 Infield popups dropped among players. 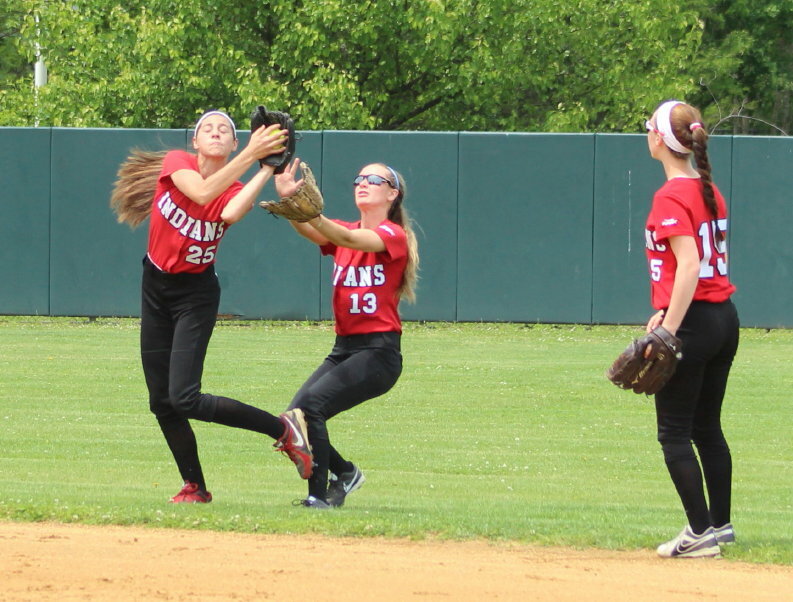 Outfield flies sailed over the heads of outfielders. 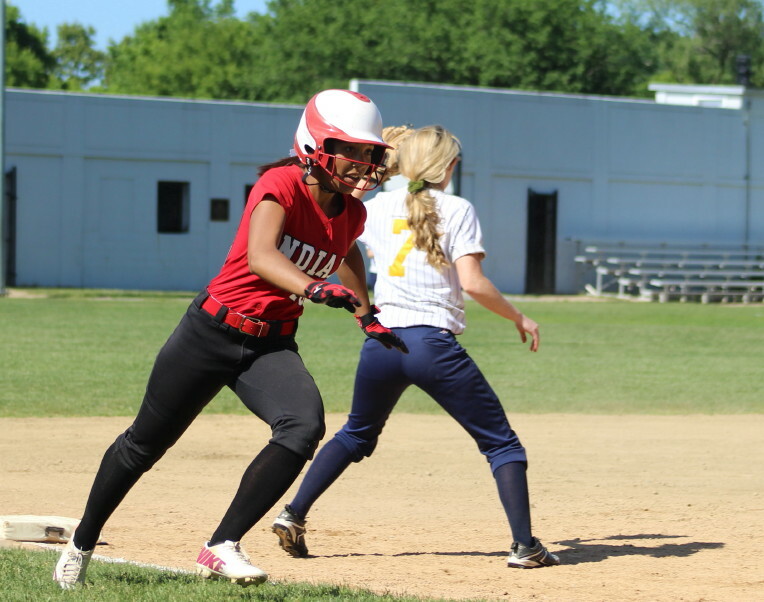 In fact, line drives right at players were dropped. 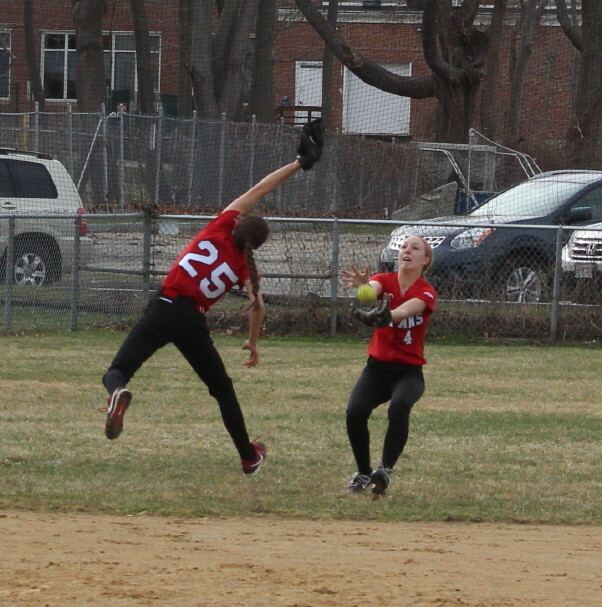 Things weren’t much better on the ground. 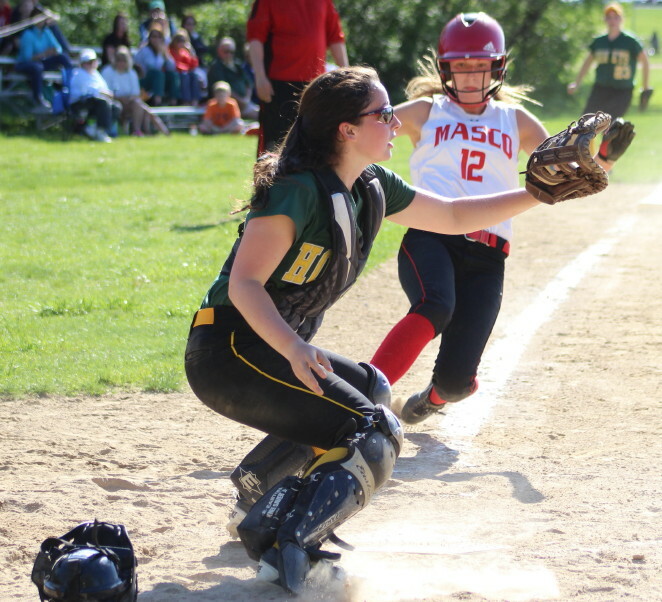 Part of the trouble for the infielders was the steady collection of baserunners serving up distractions. 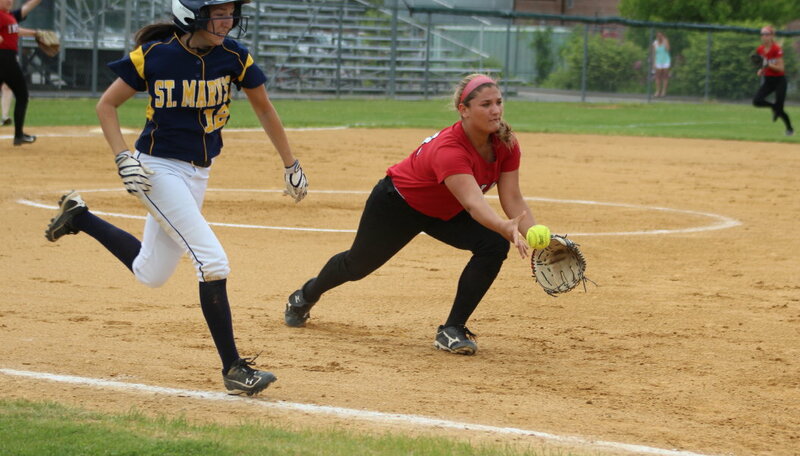 There were way too many throws to the wrong bases. 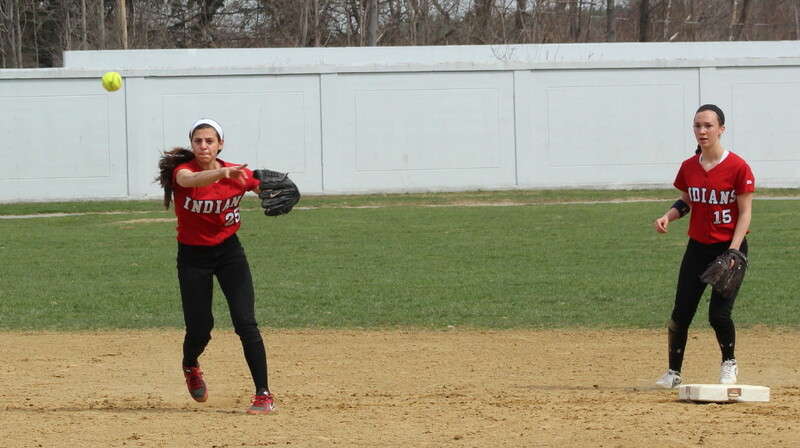 The Indians (2-1) dominated the first four innings. 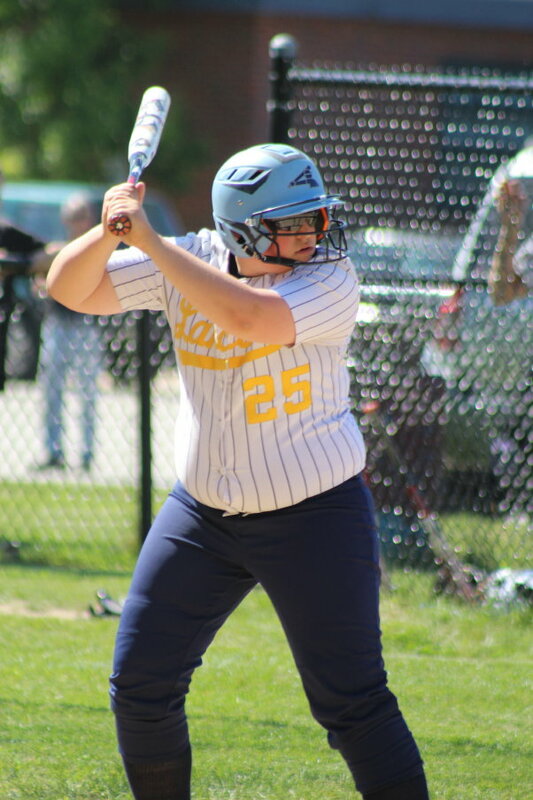 They led, 8-3, and already had eleven hits off of NHS starter Vicki Allman while AHS starter Rachel Cyr was limiting the Clippers to just three hits. 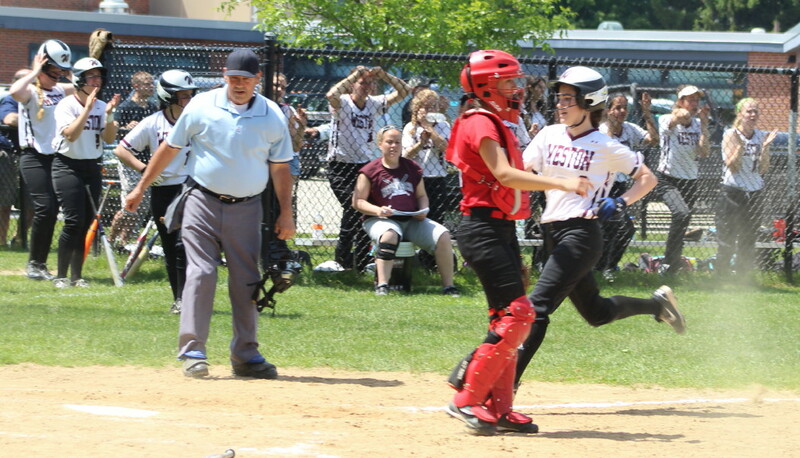 Newburyport turned things around in the fifth inning. 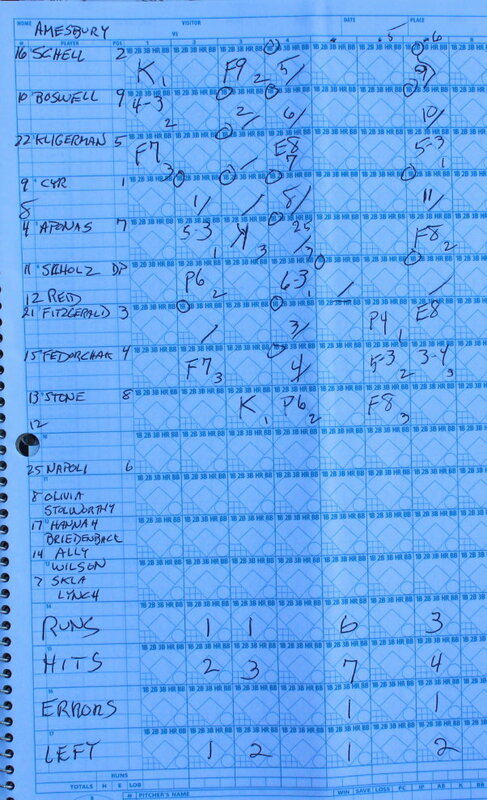 They sent twelve players to the plate and collected eight runs on just four hits. 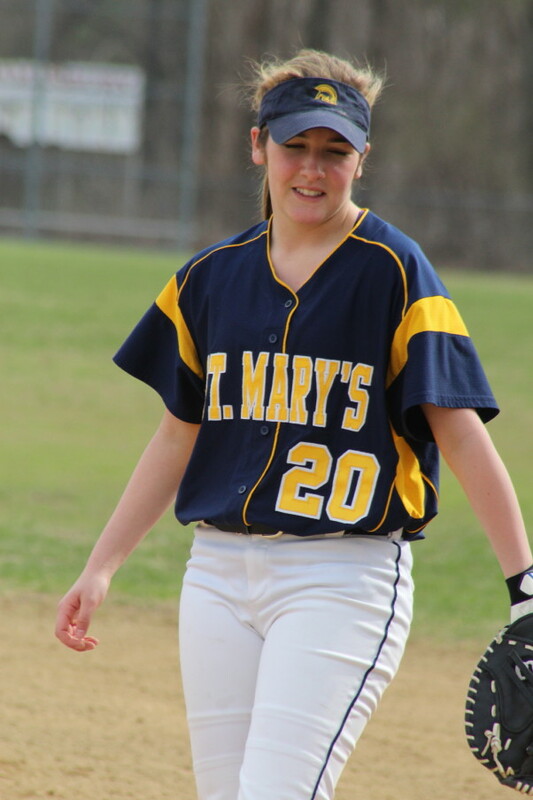 Junior Morgan Kelley tripled in two of the runs. 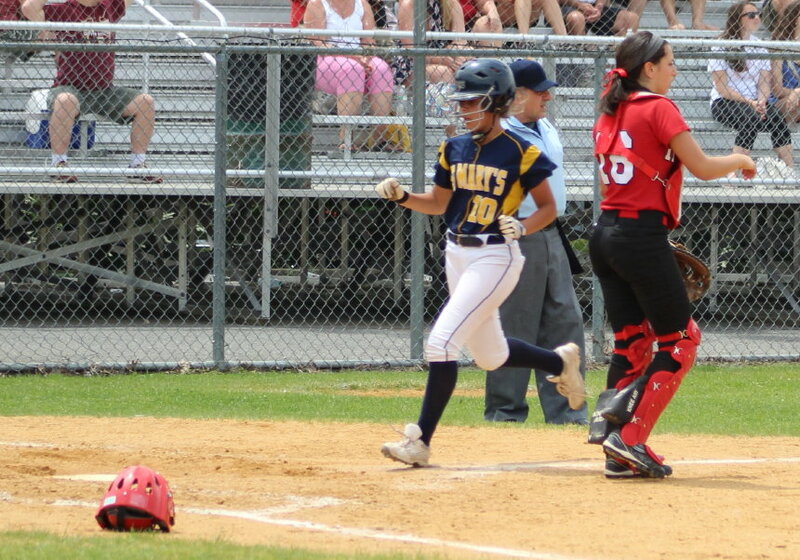 Amy Sullivan scored twice. 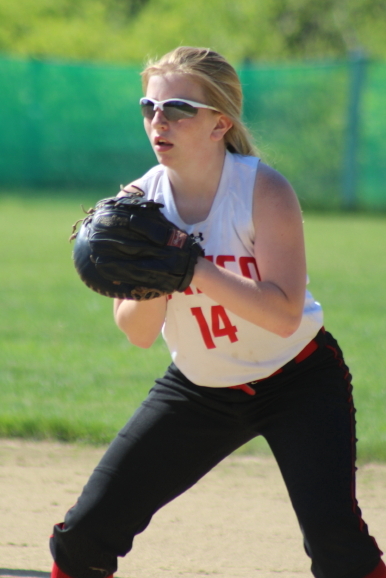 Amesbury hit the ball hard all game and finished with seventeen hits. 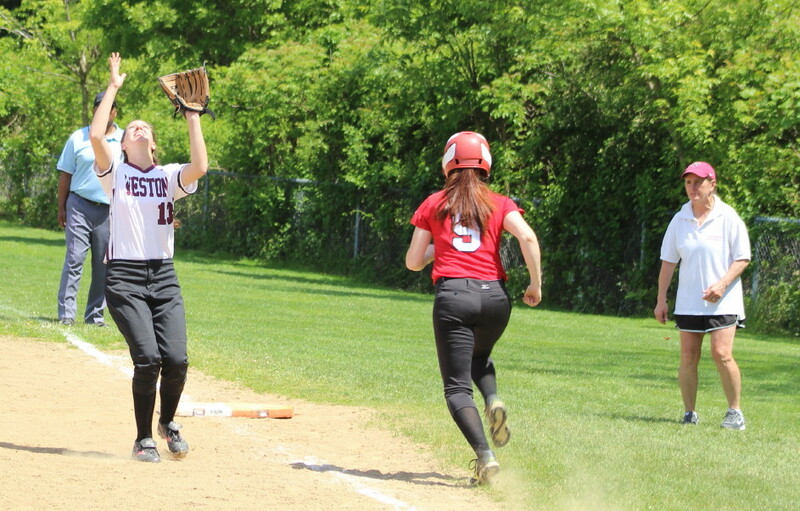 Five of the hits came in their sixth inning and they made Newburyport’s 11-8 lead disappear in a six-run inning. 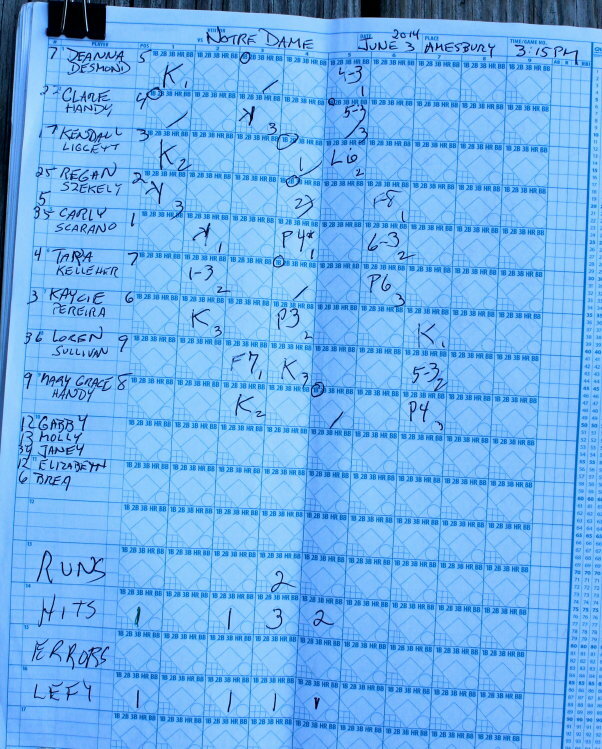 The Indians sent eleven batters to the plate. 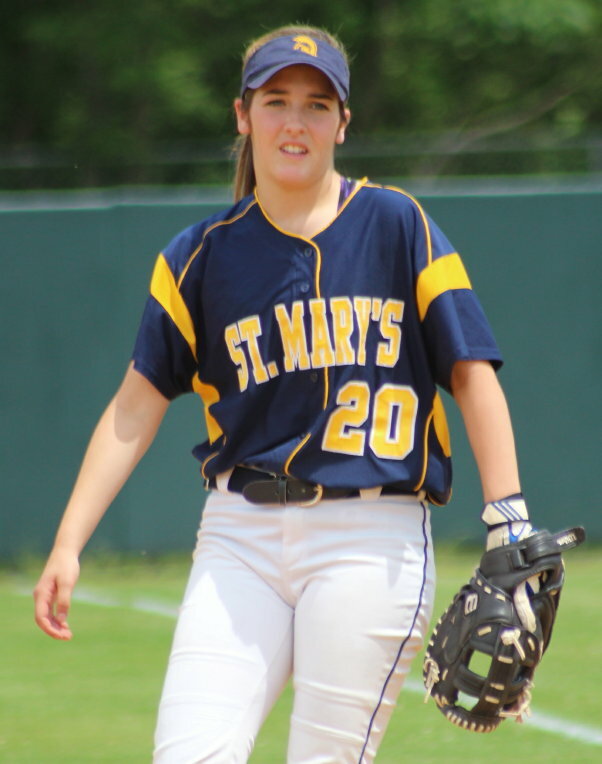 Alexi Boswell had two hits in the inning. 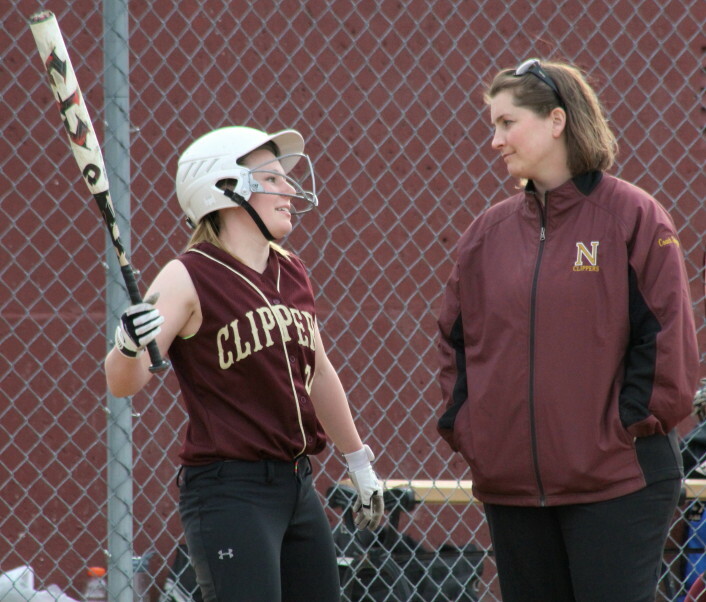 Newburyport went quietly in their sixth inning and trailed, 14-11. 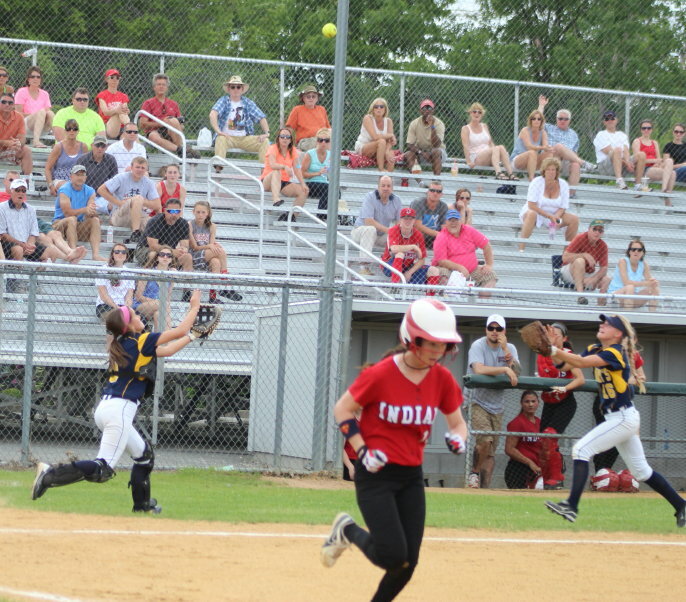 The Indians added another run in the seventh as Amanda Schell hit a ball sharply to right. 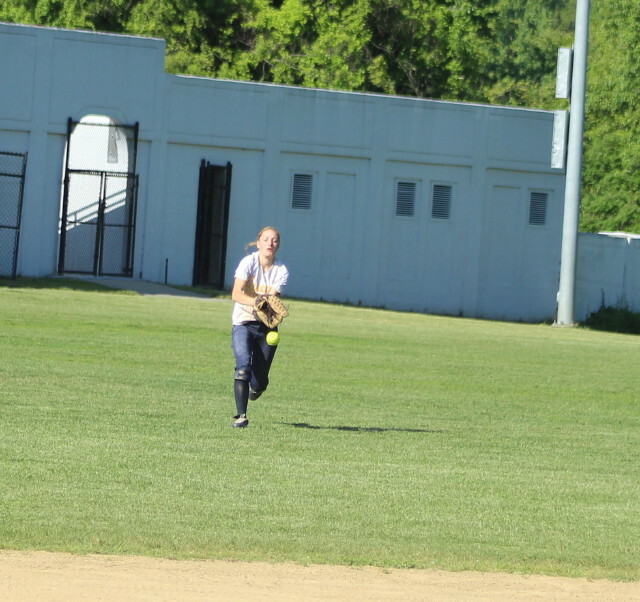 NHS rightfielder Morgan Johnston looked to have a chance on the ball but it got by her to the fence. 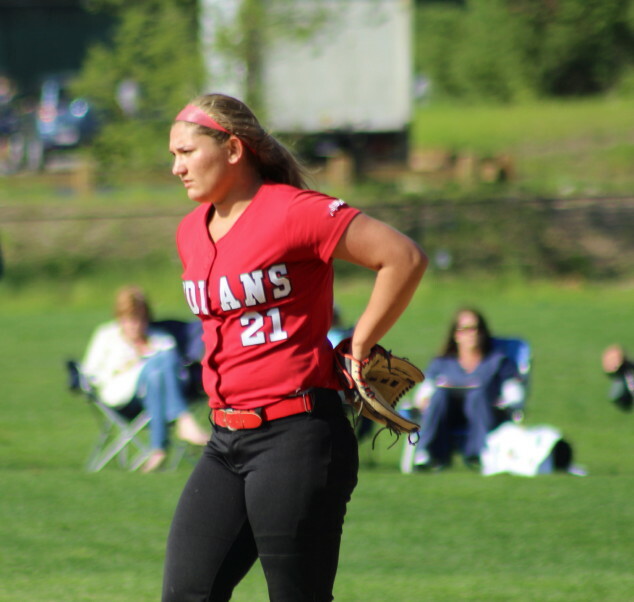 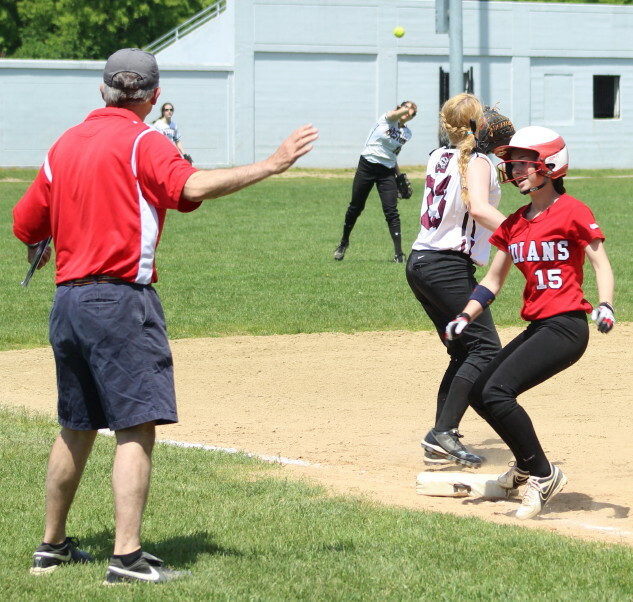 Amanda was able to circle the bases for Amesbury’s fifteenth run. 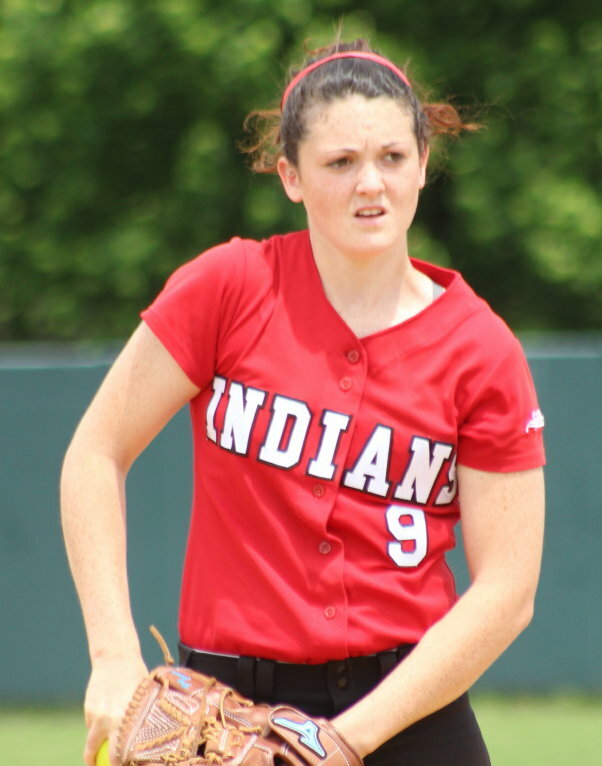 Sammy Stone pitched the scoreless sixth for the Indians and 2/3 of the seventh inning. 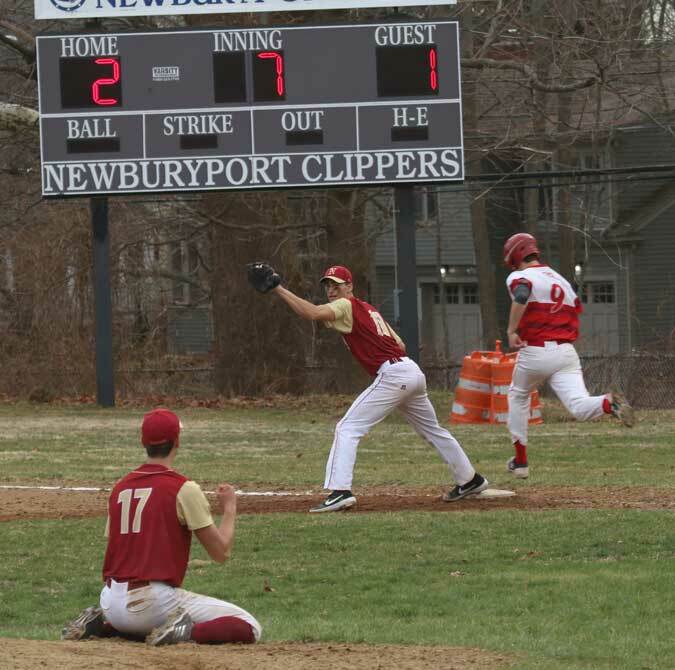 In the seventh Newburyport got down to its final out before five straight Clippers reached to win on a walkoff walk by Morgan Johnston. 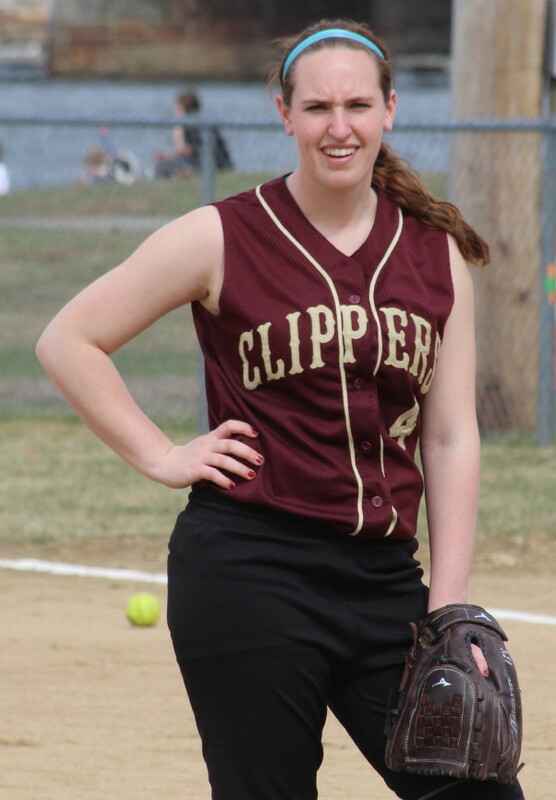 One reason for the Clippers win may well have been that despite getting hit hard pitcher Vicki Allman only walked two. 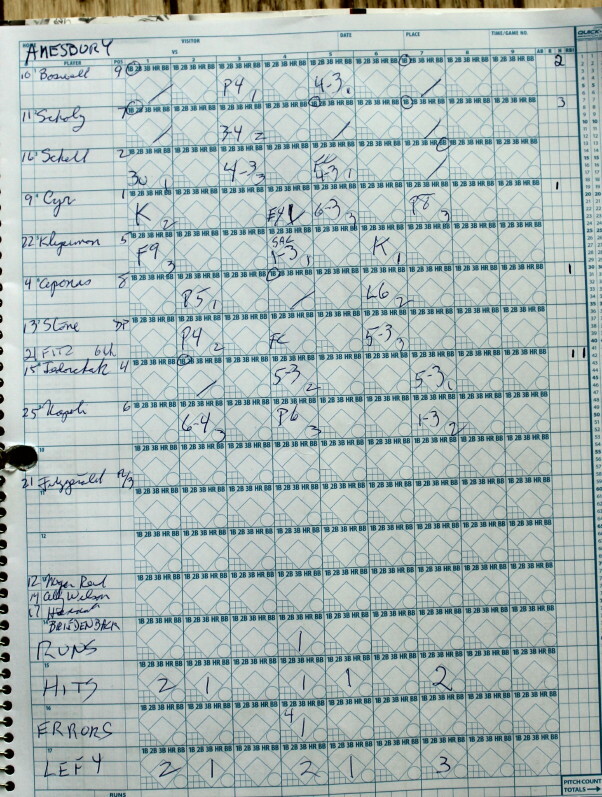 Sixteen players scored runs in this game. 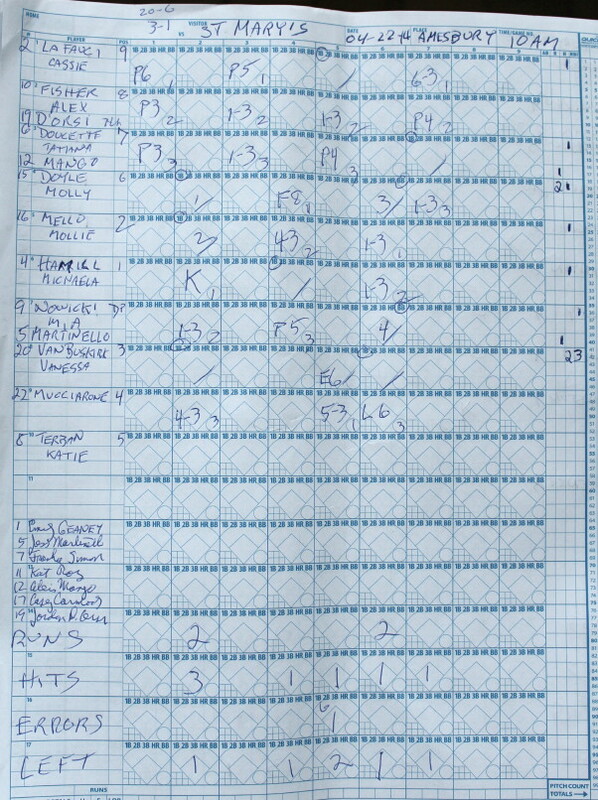 Thirteen players had RBIs. 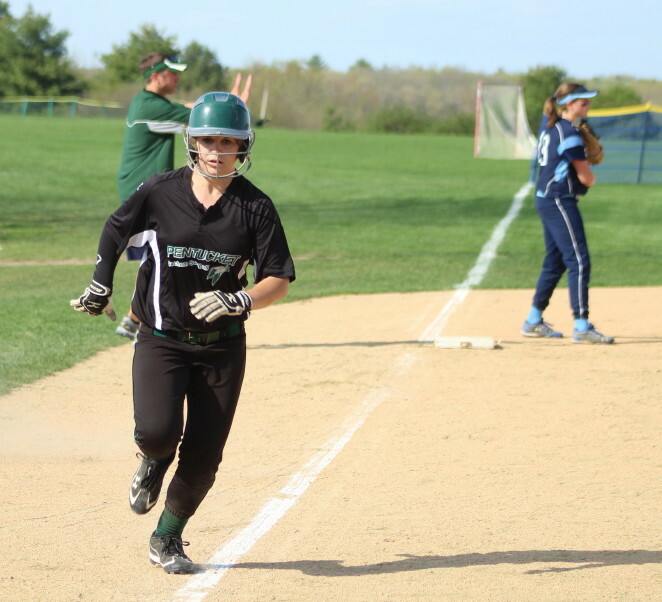 Rachel Cyr drove in four runs while Molly Kelley and Lauren Singer drove in three each. 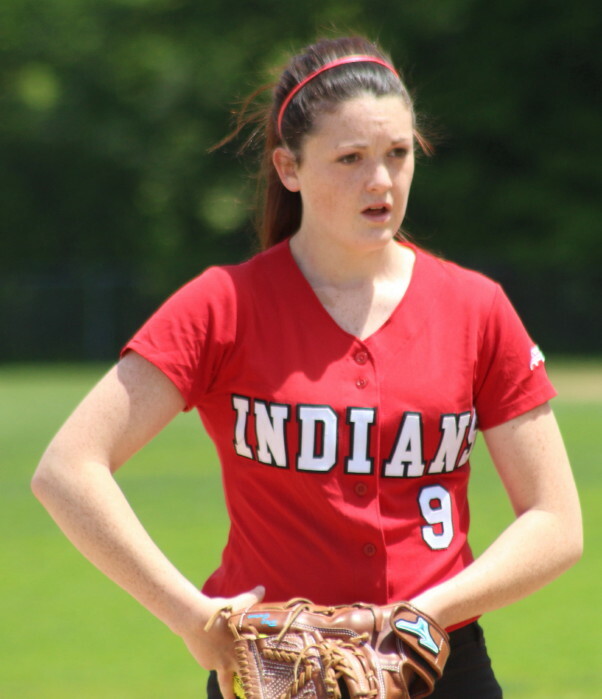 Amy Sullivan scored three times. 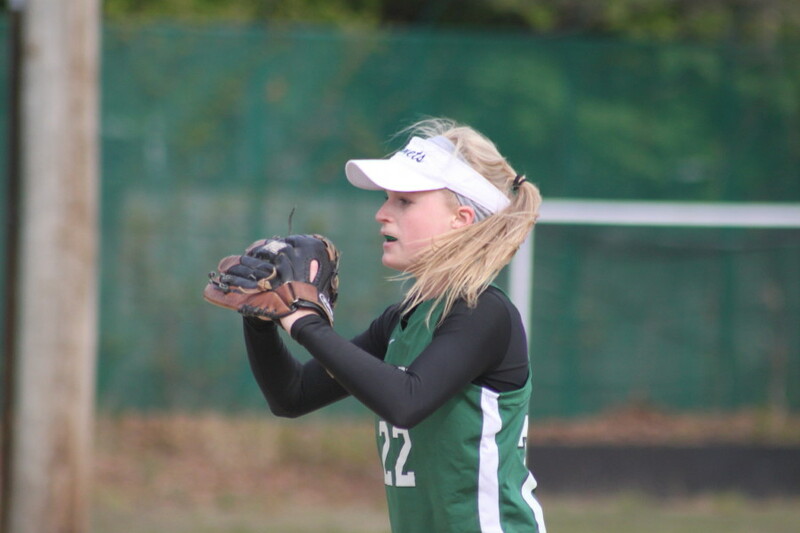 Alexi Boswell led all players with four hits, while teammates Lucy Scholz and Rachel Cyr had three apiece. 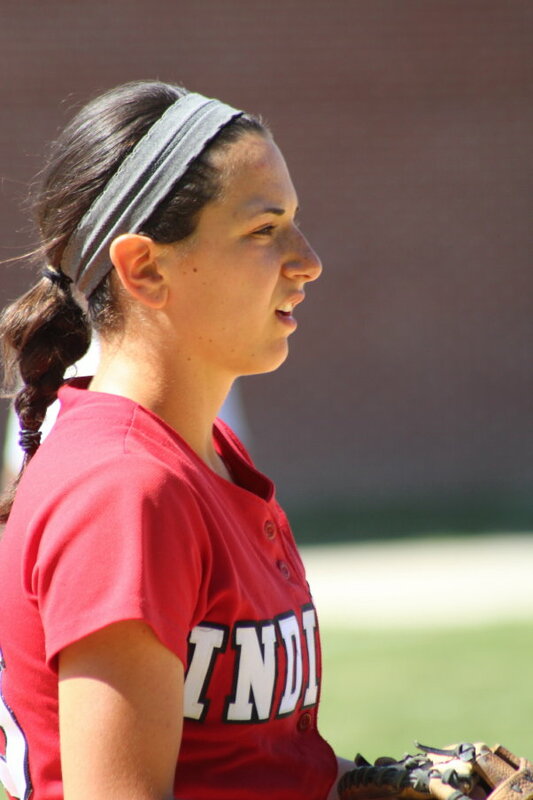 Lauren Singer had four hits for the Clippers including two triples. 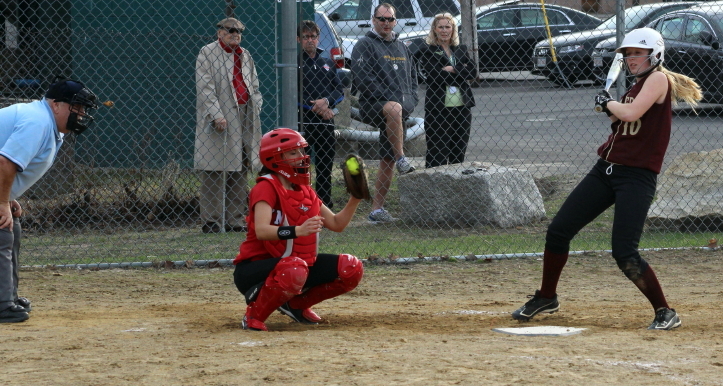 Meghan Stanton looked good taking over for Kendra Dow at shortstop for Newburyport. 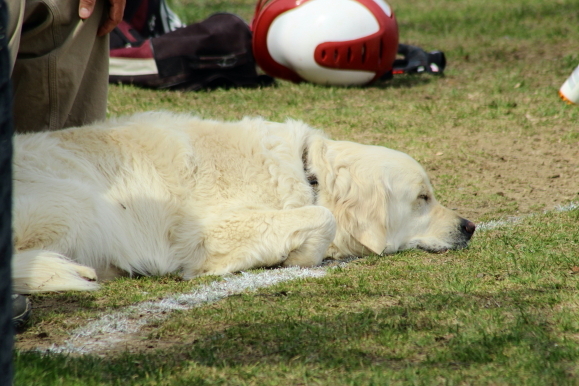 Weather? 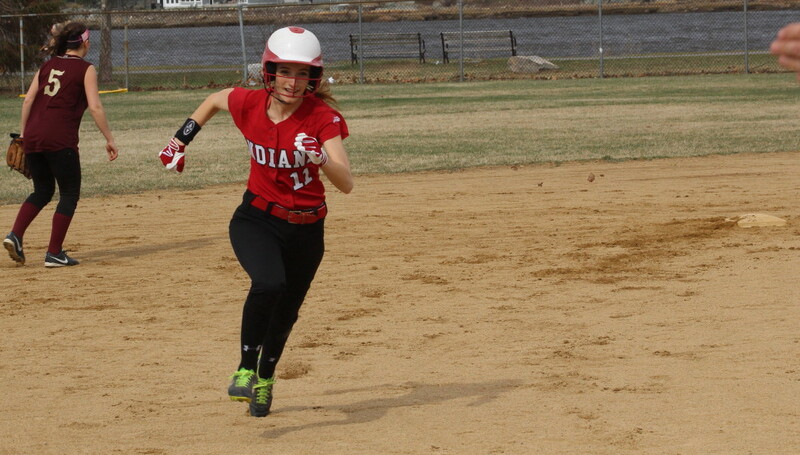 No question it was windy but it was also warm. 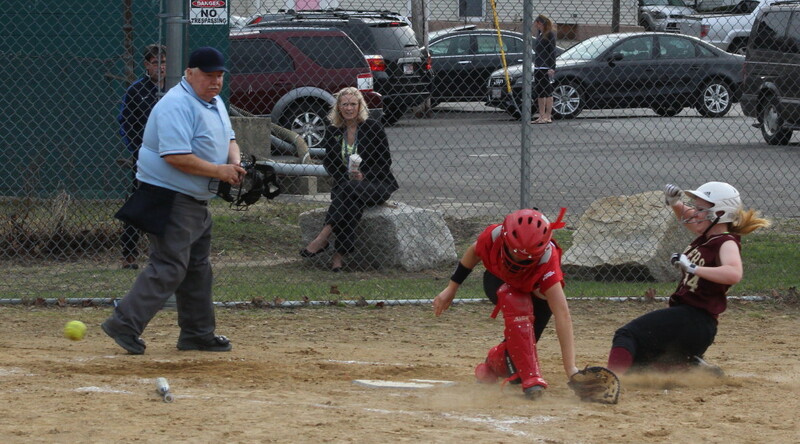 Next game for Amesbury will be hosting Rockport on Wednesday. 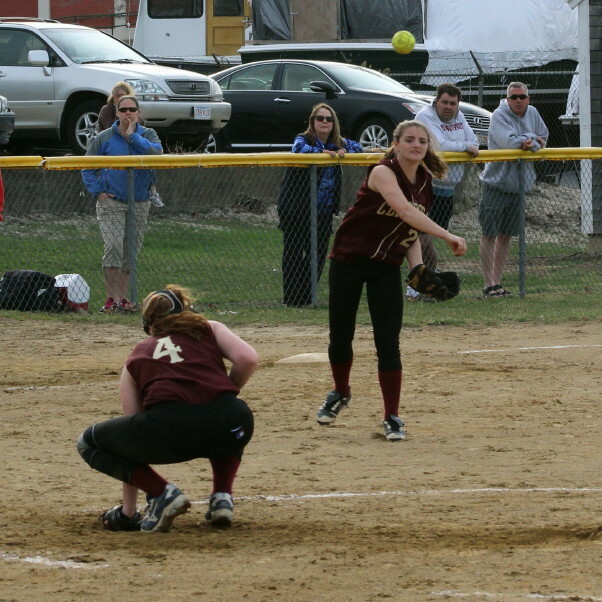 Newburyport will be traveling to Saugus on the same day.